On my earliest professional photography assignments, I shot with a 1980-era Canon AE-1 shutter priority film camera. Needless to say, shooting with the AE-1 more than a decade ago was much different from my recent gigs with DSLRs, multi remote fired strobes and all digital workflows. Which is why I was so impressed by Spiderman. In his most recent incarnation, Peter Parker uses what appears to be a film rangefinder. It’s 2012, and he’s shooting with film…I thought he was supposed to be smart? 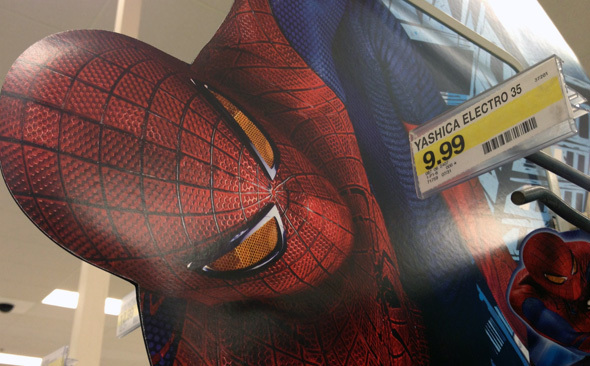 Spiderman discovers an evil plot to buy out all the copies of Yashica Electro 35 film camera. He is. There’s an incredible market for photographers who prefer to shoot film. Some are old pros who like the organic look of film, some are young pros who are experimenting with film for the first time. Look on Flickr and you’ll find millions of photos recently shot on film and scanned and uploaded. Review those shots created with wide open apertures and smooth bokeh, and you’ll discover an ethereal, almost magical quality to the images that’s difficult to achieve in-camera with a DSLR. Instagram doesn’t cut it, but I’m sure a Leica M9 and Summilux 50mm f/1.4 would come close – though you’d have to sell your house soul to afford it. All of which brings me back to the AE-1. I’m always looking for ways to deliver unique looks for our clients. So I cracked open the old camera bag, popped in a new battery, and started to shoot with film that had expired in 2001. Several things became apparent immediately. You only have 24 (or 36) exposures on one roll, so it’s important to slow down to make sure you capture the shot you want. There’s no instant review either, so metering accurately for your intended exposure is also critical. Lastly, you have to let go of the process and be open to discovery. For most projects, I’m still shooting digital. But for art and experimentation and the occasional unique look, the old AE-1 is my new imaging instrument.